Following a successful Oktoberfest themed menu at the start of the month the catering team surpassed themselves this week in organising an amazing Singapore day themed menu. With traditional music, decorations and delicious cuisine pupils could not wait to see what dishes were on offer at Highclare Senior School on Wednesday. 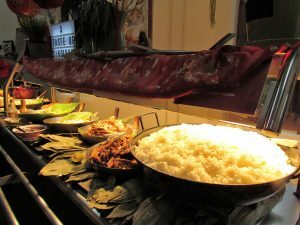 Highclare Junior schools will now follow suit and with a street style buffet including sambal roast chicken, BaBi chin (sweet soy pork), Mee Goring (Not so spicy egg noodles) and Nasi Lemak (Fragrant coconut rice) on offer we are sure our younger pupils will enjoy it just as much.